Most games want you to feel like the savior of the world, the chosen one of fate. As the one who is slated to save the world, you would likely need a ton of new weapons on your quest to take down increasingly difficult foes — weapons you’ll likely find at your friendly, local arms dealer. Weapon Shop de Omasse flips that RPG trope on its head, and instead tasks you with running your own weapon shop, providing other heroes with their implements of mass destruction. Turns out that job is about as exciting as it sounds. It’s an interesting concept. Games like Recettear or Hometown Story have put players in the shoes of the lowly shopkeep, helping the more daring to take on their difficult quests. But Weapon Shop de Omasse takes a handful of ideas and merely makes you repeat them ad nauseum without actually changing up the gameplay in any meaningful way. As the owner of the titular weapon shop, you’re tasked with keeping the throngs of patrons happy with stabby weapons, bludgeons — anything they want. Colorful customers will come in, regaling you with their life stories, and it’s up to you to figure out what they want based on the quest they’re about to pursue, and provide it for them. 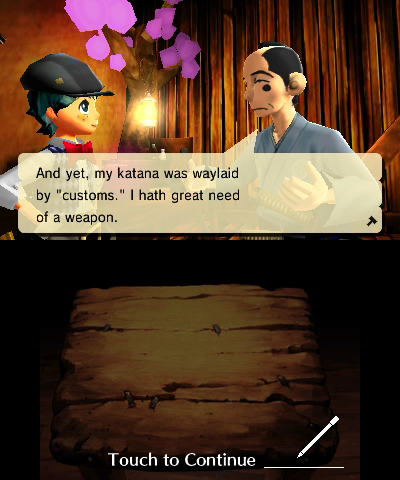 Weapons are broken down into classes — there are katanas, swords, daggers, clubs, and tons more to choose from. Each weapon is broken down further into a handful of stats like slashing, piercing, or bludgeoning damage, durability, and special effects. When customers request an item, they’ll typically come with a list of their weapon proficiency — i.e., which of the three main stats they’re strongest in at the particular moment — and you’ll need to pick the right weapon, and then craft it. What follows is a fairly simplistic rhythm game. You’ll see an on screen prompt, showing you the timing you’ll need to tap the hot iron with, and then you’ll perform that same rhythm. You can flip the weapon and move it around to make sure you’re tapping in the right spots, and once it’s finished, you’ll cool it off, view the stats your weapon has been imbued with, and you’ll hand it off to your (hopefully) happy customer. You’ll find out the outcome of your quest as you watch a quasi-Twitter feed, as they provide updates on the status of their journey. If they succeed, you get the weapon back a little stronger than it was before, as well as some cash for your hard work. If they fail, the weapon is gone for good — and you don’t get paid. And that’s it. That’s the whole game. Sure, you’ll receive requests from a handful of “important” (read: named) customers, each one with their own line of quests, as well as one-off NPCs strictly there to grind out experience and gold. And your ultimate goal of building your shop level though successful weapon creation looms overhead at all times, as the evil dark lord prepares his invasion. But Weapon Shop de Omasse never feels like you’re building up to anything — just tapping out the same rhythms to create the same kinds of weapons over and over again. To break up the monotony, Weapon Shop de Omasse tries to inject some humor into the proceedings, but everything just ends up falling flat. RPG cliches abound as you encounter a plucky female pirate, an over-zealous French fencer, a far-stronger-than-she-appears grandmother, and more — each one off on their own personal quest for whatever. But none of it matters when the humor’s as one-note as its gameplay. Add to that a buff cross-dresser whose design and character is clearly played up for cheap laughs, and you have a narrative that can be as offensive as it is unfunny. Being able to play the other, less glamorous side of the epic quest has the potential to be highly entertaining, by offering an experience rarely seen in video games. Instead, Weapon Shop de Omasse is stretched far too thin — like a long joke whose punchline isn’t worth the set-up. Weapon Shop de Omasse is an interesting idea that doesn’t go anywhere -- a humorless, flat, and repetitive package that squanders its unique concept in almost every respect.